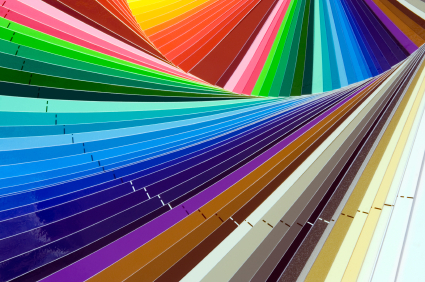 You may have noticed it the last time you bought artwork online, or perhaps when you bought a piece of furniture, or almost anything else: the colours you saw when you were browsing online didn't match the colours of the product you received. For many things, this isn't really a big deal , so we shrug and move on with our lives. But when it comes to artwork, colour is another story completely. When working in a digital medium, even if it's just to create images to sell your offline work, you absolutely must have a properly colour-managed workflow. It's frustrating, but true, there's no way around it. Fortunately, this complicated world can be made much simpler with a small investment. In a nutshell, the problem with colour is that every monitor is slightly different. You've probably noticed that the colour displays at the office or your friend's house look a little different, and you'd be right. Each manufacturer goes out of their way to provide a great viewing experience without any additional setup, but that can often mean compromising accurate colour representation in favour of added drama. Greater contrast and more saturated colours tend to be the real problem, and that goes double for black and white artwork. Fortunately, there are now a number of devices available known as colour calibrators (technically, 'colourimeters', but you may have better luck asking for a monitor calibrator if you're not technically inclined) which can be had for less than $100 that will take all the hard work out of colour management. A colourimeter plugs into a USB port on your computer and is positioned directly over the monitor. The accompanying software then displays a number of different colours on your screen, which are detected by the colourimeter. The software then automatically computes the difference between what is being supposed to be displayed and what is actually displayed, and creates a colour profile that your computer uses to ensure your monitor is displaying accurate colours. More advanced (and, typically, more expensive) colourimeters should also include a method for calibrating your printer, which can be very useful if you plan on selling prints of your digital artwork and handling the production aspects yourself. Printer calibration uses the same process as the monitor calibration, except you print out a selection of test sheets which can then be 'read' by the colourimeter.